Did you know that nearly 2 million people are living with limb loss in the United States and that approximately 185,000 amputations take place each year? These figures might make it seem as though limb loss is a common occurrence, but there is no doubt that each person’s amputation journey is unique. As a new amputee, you are adjusting to a new way of life following an amputation, and it is common to have many questions about your condition and what kind of prosthetic limbs are available to you. Cornell Orthotics & Prosthetics is here to help you regain your mobility, and in today’s post, we’ll provide an estimated recovery timeline based on average healing time and what you can expect during each phase with regard to your prosthesis. For simplicity, we’ll discuss a lower limb amputation, although the process would be similar for any amputation. Let’s get started. On the day of your amputation surgery, your doctor may do one of two things after the procedure. They may place a compressive dressing on your leg, or they may immediately apply a more rigid dressing or temporary prosthetic during surgery. From there, Cornell Orthotics & Prosthetics can provide you with a Polyethylene Semi-Rigid Removable Dressing (PSRD). We have found that the risk of falling is highest in the week after surgery, and this removable “helmet” provides your residual limb with the protection it needs during the initial healing phase. Depending on how your healing progresses, your doctor will probably remove sutures or staples around the four- to six-week mark following surgery. During this phase of your recovery, the residual limb continues to change in both shape and size as healing progresses and muscles begin to weaken. As such, Cornell Orthotics & Prosthetics can design a temporary prosthetic leg to protect the residual limb. The preparatory prosthesis is simple in design, adjustable, and relatively inexpensive, and it may need to be changed every few months depending on how the residual limb changes. Once your residual limb has matured and is relatively stable in terms of size and shape, you can be fitted for a definitive prosthesis. This may be around the four- to six-month mark after your surgery, depending on your healing process. During this phase, Cornell Orthotics & Prosthetics will work with you to design a prosthesis that best suits your needs. We’ll work with you every step of the way, from determining the socket design to making important decisions related to your prosthetic limb’s components. When you work with Cornell Orthotics & Prosthetics, you have a partner you can count on for the long run. We can help you if your prosthetic needs to be replaced, and we can also provide socket modifications. Your prosthesis will experience wear and tear, and the average prosthesis can last anywhere from one to 15 years. Do You Have Questions About Your Prosthetic? We understand that each individual’s healing process can vary significantly. Whether you are in the initial recovery phase or you are concerned that your temporary prosthetic leg needs to be updated, Cornell Orthotics & Prosthetics is here for you. We provide pre- and post-amputation consultations for free and will work with you to design a custom prosthesis to restore your mobility. 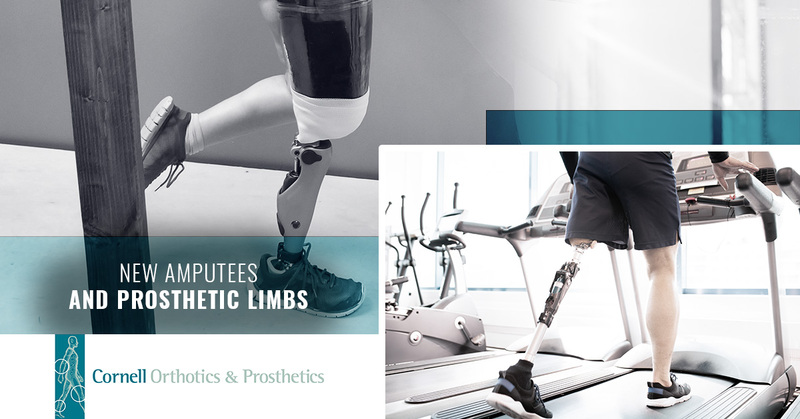 Discover the freedom that quality prosthetic limbs and our knowledgeable services can provide new amputees — contact our prosthetist in Beverly today.